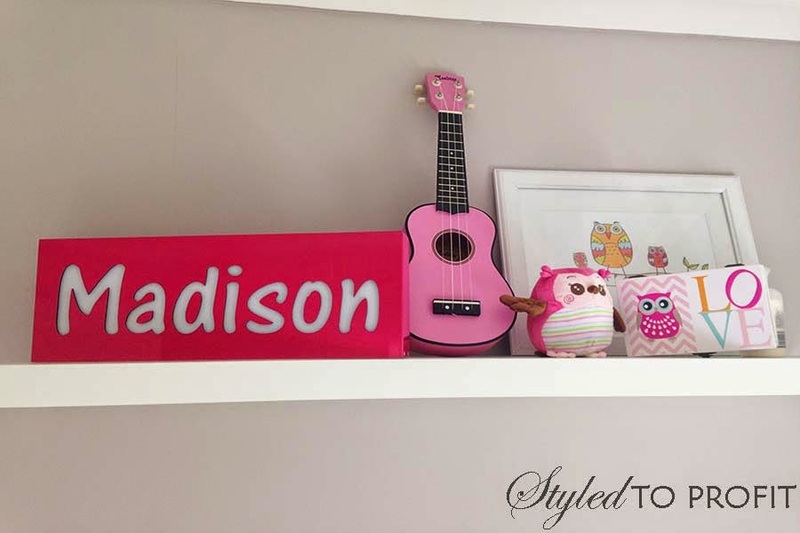 Styled to Profit: Nursery Sneak Peak! I have wanted to put together a proper nursery from the minute I fell pregnant, but we have not been in a home that we planned on staying in so it has been super hard to do things when we were only going to be in the house for a few more months. The home we were in when she was born is now gone and I told my husband that I was going to make her bedroom special in this home. There is so much that I want to do but again, we will most likely only be in this house for 12-18 months so I have hesitated to do exactly what I wanted to do. I did however put a few things together to make her room that little bit special. He room is still a work in progress so today you will only be getting a sneak peak! 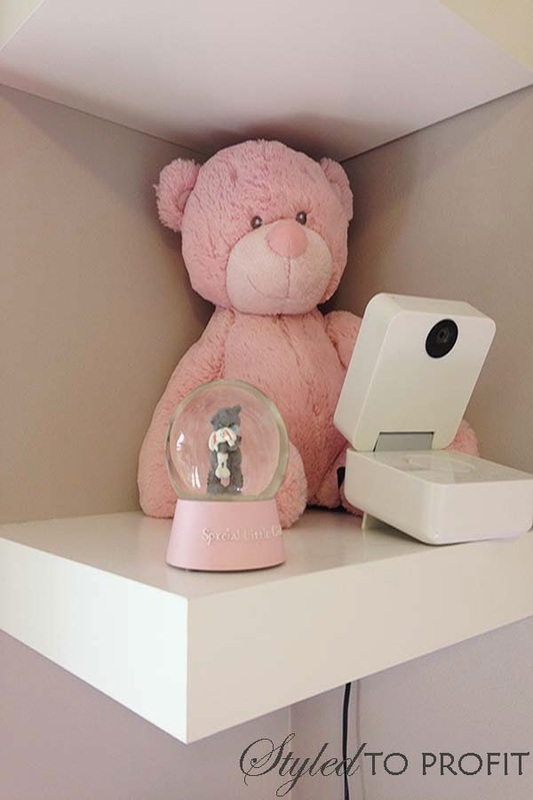 We used to have the baby monitor on the end of the cot, however as soon as Madison could stand on her own she would pull it down and play with it. Really scary when you turn it on to have a look and you see a huge pair of eyes staring back at you, so needed a place for the monitor. I decided to put a few shelves up in the corner, they had to be floating, I hate the look of brackets on a wall, they are simply ugly in my opinion. So floating shelves went up, the monitor went on the shelves and and few decorations, I want it to match a little bit more but it's hard when people buy things for her room. I have to find a place for them, people have been so generous so it's only right to put their gifts on display. I made a few fun things to go on the wall above her bed. I made a framed butterfly artwork and a button M canvas, so simple but I love how they turned out. I just drew out the chevron pattern and free hand painted the grey. The grey colour is actually the wall colour with a bit of black paint added to it, wanted to keep as much of the colour as possible. I then cut and glued a piece of pink material in the shape of an M. I put this on mainly because I didn't want the chevron pattern to show through the button holes. 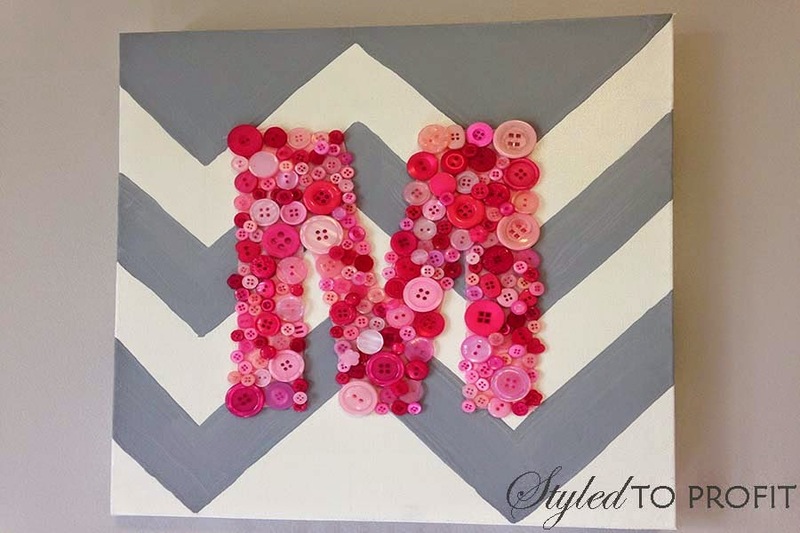 I then picked up an assortment of pink buttons from spotlight and began gluing them on the M with a hot glue gun. I like the way it turned out, it's a bit rough but I like that it looks home made. I also found a bunting pattern I liked from spotlight so picked that up and put that together using a borrowed sewing machine, I have my own now so won't need to borrow next time....so excited! 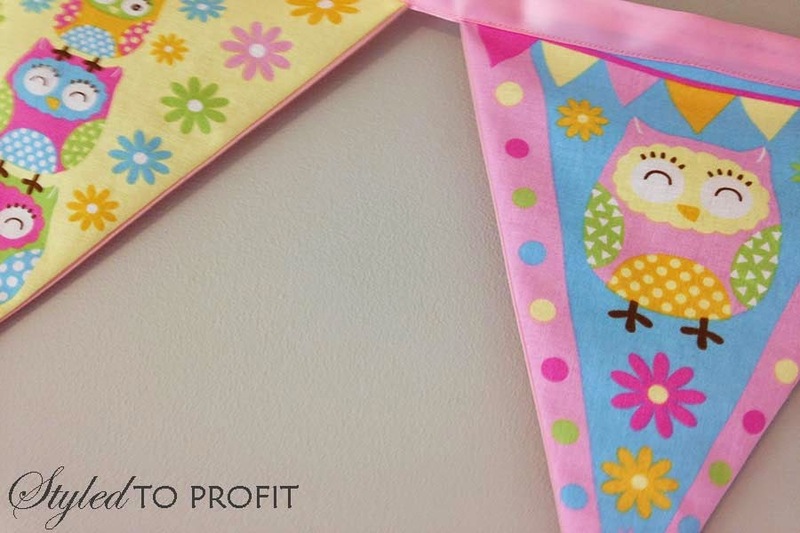 It's the same theme as the bunting I used on Madison's first birthday, you can check that out here. On the wall opposite her cot we have the change table, a little bean bag and shelf with some more decor. The pink Madison decor is actually a light, I love it so much but unfortunately there is no power point on this side of the room so I can't turn it on. Note to self: arrange to have more than one power point in her next bedroom! You can see the owl theme in full swing on this shelf. I have a few other ideas for this wall which include a reading nook to go with the bean bag but I haven't had the chance to finish them yet. It will actually be a DIY post that I will share with you as soon as I have time to get it done. Hopefully sooner rather than later. 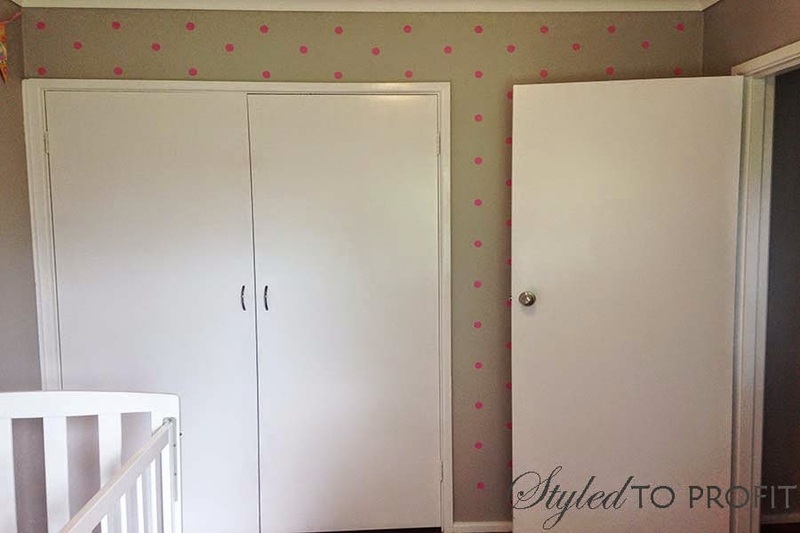 I had made all the other walls pretty but there was the one wall that was full of doors! I had to do something to make it stand out and be fabulous enough for my little girl. 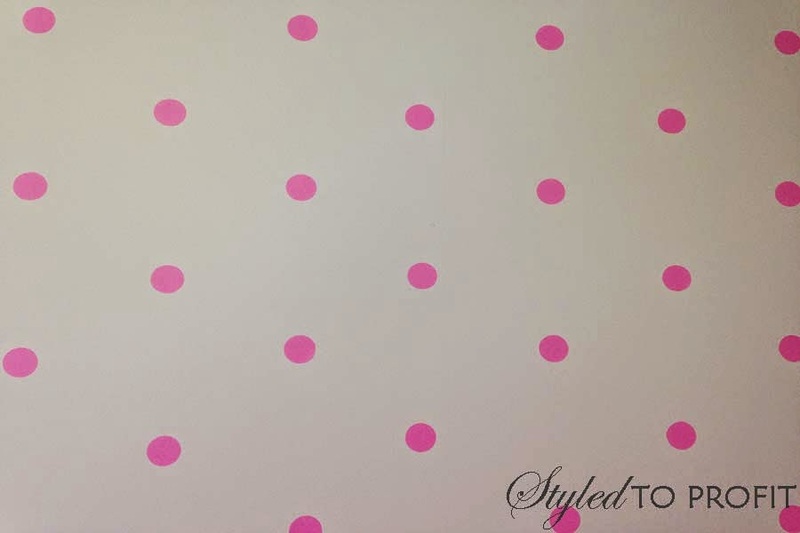 I resorted to finding some sticky vinyl in pink, cut out circle shapes with a punch and stuck them on the wall. 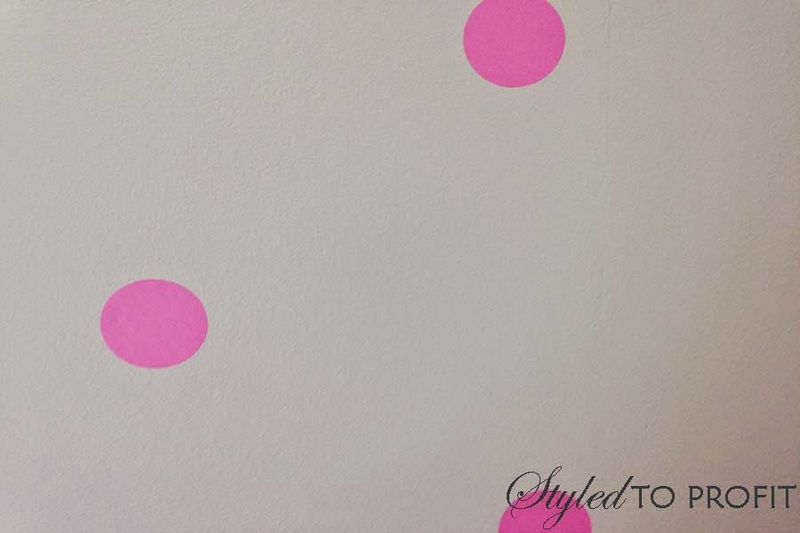 I wanted to give the impression of wallpaper but didn't want to put wallpaper on the wall, I have had a few bad experiences with wallpaper that I haven't quite gotten over so I'm not ready for that yet. I ended up free handing the placement of the stickers so a few of them are a little off but most of them are pretty good. I started with the line from ceiling to floor next to the wardrobe and used that as my base. Seemed to work out well so I'm pretty happy with it. 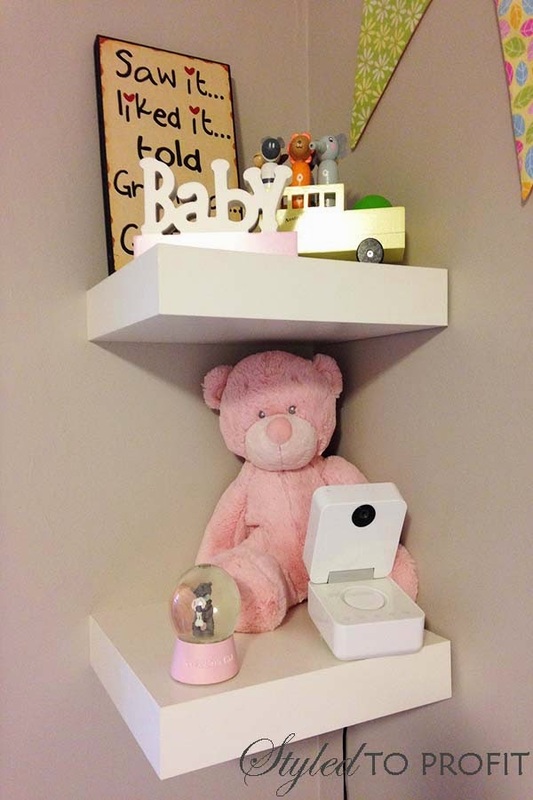 The last wall in her bedroom is the window wall with the floating shelves on each side. I decided I didn't want to do anything with this wall, a little too much and probably wouldn't look right so I just left this one. 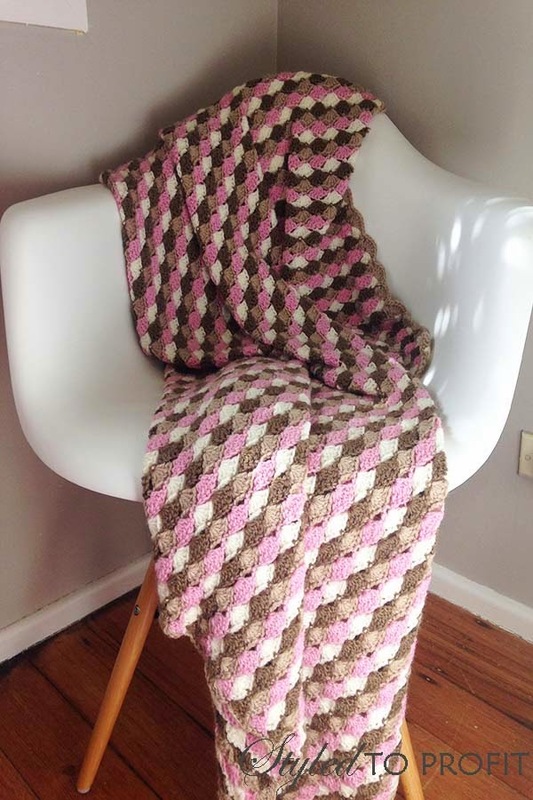 I threw a chair in the corner of the room for those late night wake ups when I needed somewhere to sit, added a beautiful blanket for the chilly nights and done! As I mentioned above there are so many more ideas and things I want to do. I am lucky enough that we will be in a new house in potentially 12-18 months so have the chance to change it up and do something else in her next room. I am so lucky because I have way too many ideas to just stop at one room. I also have plans for the light in this room. A lot of the time when decorating a room people forget about the light. I haven't forgotten about it but I am just waiting for the right thing to come along. I would love a chandelier but they are quite pricey so I have something else in mind. If I can't find it soon I will most likely DIY it, and don't worry I will share that with you all as well.